Bainbridge Island is linked to the Kitsap Peninsula by the Agate Pass Bridge and sits across the Puget Sound from Seattle, with downtown Seattle easily access via a 35-minute ferry ride from the Bainbridge Island Ferry Terminal. Bainbridge Island waterfront real estate owners often move here not only for the water and mountain views, but the peace and tranquility, with the silence interrupted only by the waves that gently lap across the shore. Known as the crown jewel of the Puget Sound, purchasing Bainbridge Island waterfront real estate property brings easy access to popular outdoor activities that include everything from sailing, boating, crabbing and kayaking to hiking and biking. Boating enthusiasts will appreciate having multiple marinas to choose from, with easy boating access to central Puget Sound. Bainbridge has a significant creative vibe too, that began when countless artists, poets, writers and musicians arrived in the 1970s and ‘80s to get inspired by the serene environment. Today, cultural and artistic events still abound, not only in fabulous local cafes, pubs and coffee shops, but at the Bainbridge Performing Arts Center and the Lynwood Theatre. Bainbridge Island waterfront homes allow owners to soak up the stunning colors at sunrise and be mesmerized by the boats that gently drifty by throughout the day, as well as the songs of the birds and falling asleep to the gentle waves. Bainbridge Island waterfront real estate includes some of the most breathtaking properties not only in the Puget Sound but the entire nation. Whether you’re looking for new construction or a resale home, you’ll find the best of the best here, like a secluded property on an acre of land with no-bank western waterfront providing sweeping vistas from a wraparound veranda, with the beach just a short walk down a cleared trail. 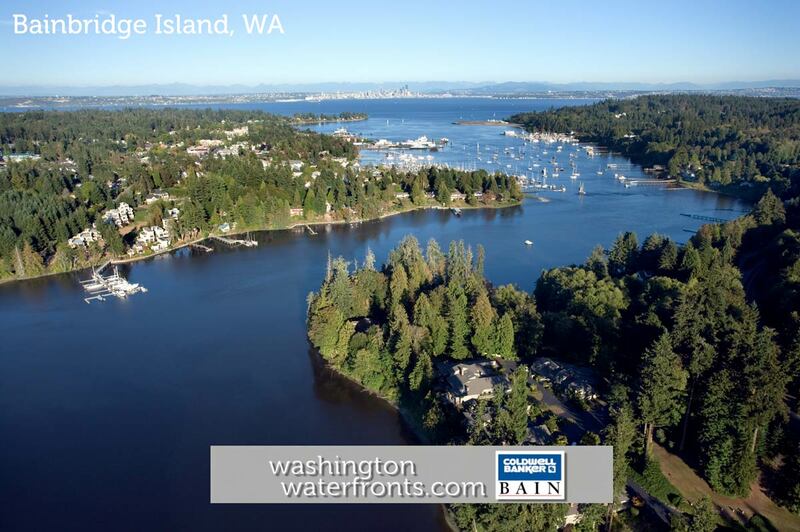 Take advantage of our industry-leading tools to make your property search as easy as possible and be sure to register for a FREE account so that you can receive email alerts whenever new Bainbridge Island waterfront real estate for sale hits the market. If you're seeking to sell your Bainbridge Island waterfront property, contact our Waterfront Specialists directly for a comprehensive listing analysis and to learn more about the cutting-edge marketing strategies we'll use to sell your home quickly for top dollar!